Any discussion of the Bills quarterback situation usually involves two main questions and just two of the three QB’s on the roster. When will Josh Allen be ready to play? How will the team do with A.J. McCarron as the starter until that happens? There is a third quarterback on the roster, and I’ve always believed he’s much more in the mix to be the starter than anyone is considering. 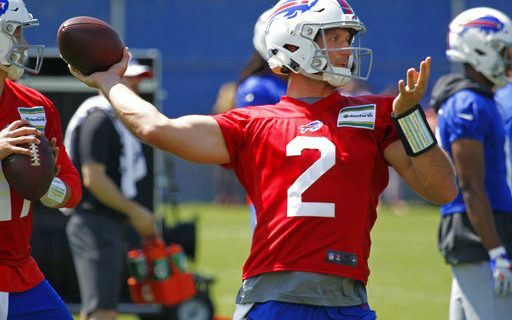 If you haven’t given any thought to Nathan Peterman being the starter, then the news of last week’s OTA’s should change your mind. The second year signalcaller continued to rotate with McCarron, and got most of the starters reps at Thursday’s practice. That came as a surprise to many, who have just assumed that McCarron will be the starter until Allen is ready. I’m here to tell you that’s a bad assumption, and you better be ready to wrap your head around the idea that Peterman could break the huddle in Baltimore on September 9. Here’s why I believe that could happen. I don’t mean the city. I mean that Peterman was here all of last year, and is familiar with what it means to be a Buffalo Bill. More importantly, Sean McDermott is familiar with him. Not just familiar, but invested in the 2017 5th round draft pick. That was clear when McDermott decided to start Peterman against the Chargers in Week 10. Yes, I know there is a new offense and new coordinator in Brian Daboll. But a lot of what happened last year will still be familiar to Nathan. That includes the players he’s out there with in the huddle. Top receiving options McCoy, Benjamin, Clay and Jones have all caught Peterman’s passes for a year. Of the three quarterbacks, Peterman is the only one who didn’t have to introduce himself to everyone this winter. That’s important. You don’t make the move the Bills coach did in midseason if you don’t believe in the guy you’re making the starter. Was it done because Tyrod Taylor’s ineffectiveness was hurting the team? Yes. But that doesn’t mean McDermott would have made the move for that reason only. The new Bills regime drafted Peterman, and they have clearly showed an allegiance to the players they picked. The Bills liked what they had in Peterman, and I don’t believe that is gone. Yes, they drafted a new QB and signed another one. Clear signs that they need to be better at the position. But that doesn’t mean they don’t see a role for Peterman, and it surely means that they’ll give him a shot to win the starting job and hold it until Allen is ready to go. Plenty of NFL players have had long careers because they had a coach who liked them and believed in them and wanted to keep them around. We all know what happened. Five interceptions in the first half. One of the ugliest performances in NFL history. But it was one game, and it shouldn’t define a career. You wouldn’t want Peterman to dwell on it. Clearly, he hasn’t. “Yeah, I mean, [I’ve] talked about last year a lot. To be honest, I’m kind of [moved] on to this year. I learned so many great lessons last year. I thought I had some ups, some downs as well. As much as those things happens, it’s just on to this year and it’s a fresh start. [I’ve been] learning a lot, new offense, new players, new coaches, and it’s an exciting start,” Peterman told reporters at last week’s OTA practices. There were snippets of positive play from Peterman in his other performances. He was quick to make reads and get rid of the ball. Not enough to convince anyone he’s a lock to be a longtime NFL QB, but enough to feel like that could happen. I know the Chargers game is all that anyone thinks of when Peterman’s name is mentioned. Until he has a good game, it will stay that way. But he needs to get a chance to do that. Part of the reason why Peterman is in the mix to start is the competition. One is a raw rookie in Allen. The other is a quarterback with only 11 career games and three career starts. Yes, McCarron has a better resume than Peterman. But how much? He played OK in his starts replacing Andy Dalton in 2015. That’s a good sign. But McCarron barely got off the bench. There’s still too much we don’t know about a guy who has never been a starter in the NFL. Like Peterman, he’s a fifth round draft pick. That means there were serious question about his ability coming out of college. I’m a little concerned that there didn’t appear to be a robust market for McCarron during this year’s free agency. It appears he wasn’t even the Bills first choice, as they reportedly pursued Sam Bradford as the bridge QB for 2018. So it’s not like a bigtime, proven NFL quarterback is standing in the way of Peterman. Based on the OTA’s, the Bills certainly are. Now that the news has been revealed, it’s time for Buffalo sports fans to do that same. Like him or not, unable to forget the Chargers game or not, Peterman is in the mix. Much like all the fans who didn’t want Allen but have now warmed up to his talent and potential, they may have to do the same for Peterman. He very possibly could be the Buffalo Bills quarterback who takes the season’s first snap.